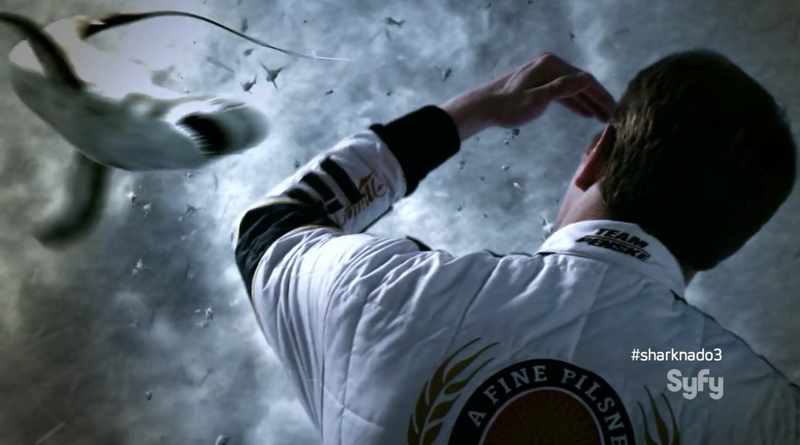 Plenty of NASCAR fans, drivers and crew have their reasons for wanting to take a swing at Brad Keselowski, but what about sending in a Sharknado? As in, a ridiculous made-for-TV tornado full of sharks? If you’ve got a beef with Keselowski, your day has just been made. Look who’s in Sharknado 3: Oh Hell No! Does this mean that we finally get a NASCAR race with sharks? Even if it’s just a movie scene, I think we can all agree that sharks flying through the air are the right way to spice up the Chase for the Sprint Cup. The Sharknado series knows it’s a terrible idea for a movie, and revels in it. According to For the Win, Sprint Cup driver Joey Logano will also be making an appearance, along with Washington Redskins player Ryan Kerrigan, master of walking disasters Jerry Springer, WWE superstar Chris Jericho, ESPN reporter Michelle Beadle and everybody’s favorite dreamboat, David Hasselhoff. It’s a huge ensemble cast which should be a good ol’ time, especially if there’s a Hasselhoff vs. Logano vs. Shark smackdown at some point.